A.C.M. Laboratory offers a NATA accredited service for the calibration of vee blocks. The vee blocks are measured in temperature controlled (20 ± 0.5 ˚C) laboratory using special equipment and methods designed and built by ACM Laboratory metrologist. 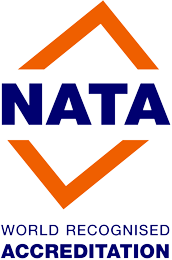 We provide full NATA calibration as following, and you can also select any of these features for partial calibration. Mutual squareness of adjacent exterior faces. Parallelism of vee axis to base and side faces. Equality of semi-angles of vee flanks. Centrality of vee between side faces. Please contact us to discuss your requirements and book in your order. To enable us to provide you the accurate quotation, please provide the following information: manufacturer, size and type. We also can supply variety of vee blocks, and we offer very competitive prices when purchased in conjunction with our calibration service.